We can supply discs and tags in plastic, aluminium, brass and steel. We can cut out any size of plastic discs with or without fixing holes and offer a quick delivery. 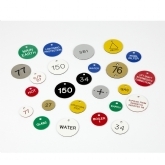 Discs can be used to mark room doors, table numbers, fire safety, pipe identification, valve tags plus many other things. We carry a variety of sizes in stainless steel but we can manufacuture to order if necessary.